A monk chat at Wat Chedi Luang, Chiang Mai. Photo by David Lansing. This was at the Wat Chedi Luang, in the old section of Chiang Mai. So I went and sat down with a monk. Who looked very young. “You look about 15,” I told him. I told him I probably wasn’t as up on Lindsay as he was but it seemed to me she was either in rehab or had just gotten out. “Always in rehab!” said the monk, giggling. It took me a moment to figure out that he was handicapping the Oscars. I told him I liked Woody Allen’s latest movie, Blue Jasmine. 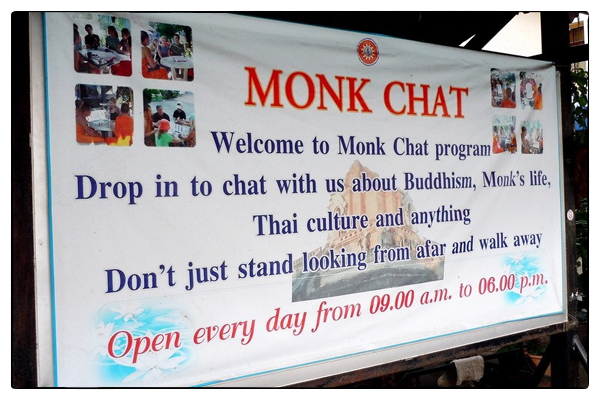 Then the monk talked about American Idol for awhile. He loved J-Lo but he wasn’t sure who Harry Connick Jr. was. I tried to explain. He listened patiently, nodding, and then said, “Jay-Yo!” Big fan of J-Lo. I told him I was a little surprised that he listened to music. He reached in to the folds of his saffron robe and pulled out a smart phone. He punched at the screen and a moment later, a tinny version of Jennifer Lopez singing “Dance Again” with Pitbull filled the air. The little monk lifted his arms in the air and rocked out. “No wray Rose!” sang the monk. I smiled, stood up, thanked him for his time, and went to look for Ketsara. 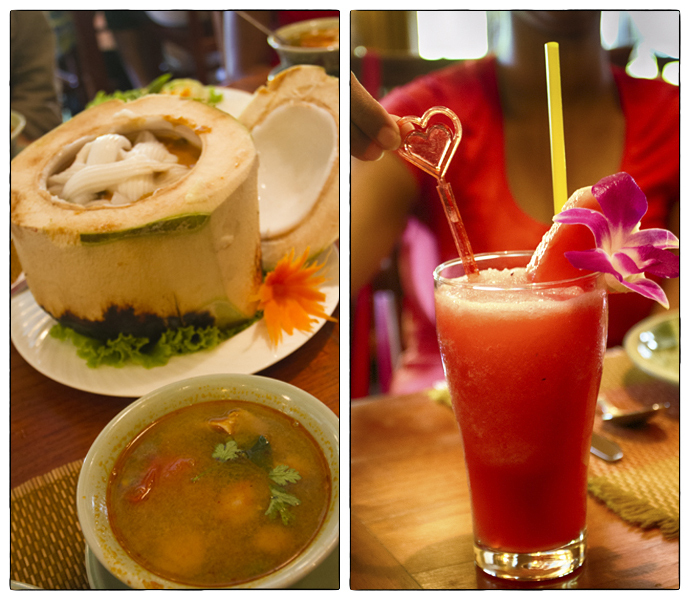 Hot and cool: Spicy shrimp in a whole coconut and a refreshing watermelon smoothie at Whole Earth in Chiang Mai. Photos by David Lansing. Ketsara has me thoroughly confused. After getting me up before dawn to go feed the Buddhist monks and then dragging me up 304 steps to Wat Doi Suthep to work on my Buddhist parami (perfection), she takes me to lunch at a place that was originally set up as a transcendental meditation compound by Maharishi Mahesh Yogi in 1970. Remember Maharishi Yogi? He was the Beatle’s guru, the one who really got George Harrison into the whole Indian thing. He didn’t exactly invent transcendental meditation but he’s probably the guy that made the whole movement explode back in the 70s. And as part of that, he set up a transcendental meditation retreat in Chiang Mai and opened up the city’s first vegetarian restaurant, Whole Earth. The yogi died in 2008 and Whole Earth is no longer strictly vegetarian (though they certainly lean that way). 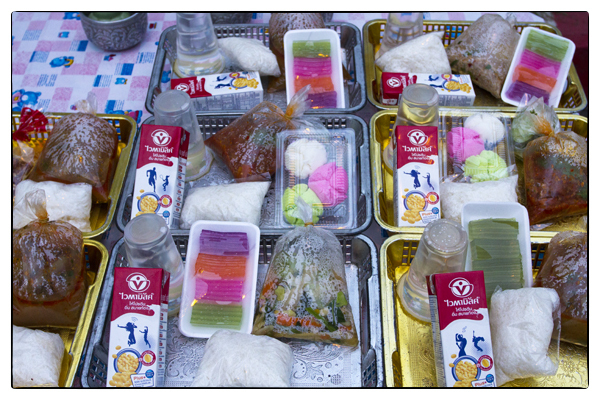 But here’s the big surprise: This may have been the best meal I’ve had in Thailand. From the classical Tom Yum soup to the sautéed eggplant with ginger to the sweet and sour prawns served in a whole coconut, everything was outstanding. Still, I had to wonder why Ketsara took me here. So I asked her. And then, as I panted after accidentally eating a whole Thai pepper, she ordered me a cooling watermelon smoothie. With intertwined hearts for a swizzle stick. 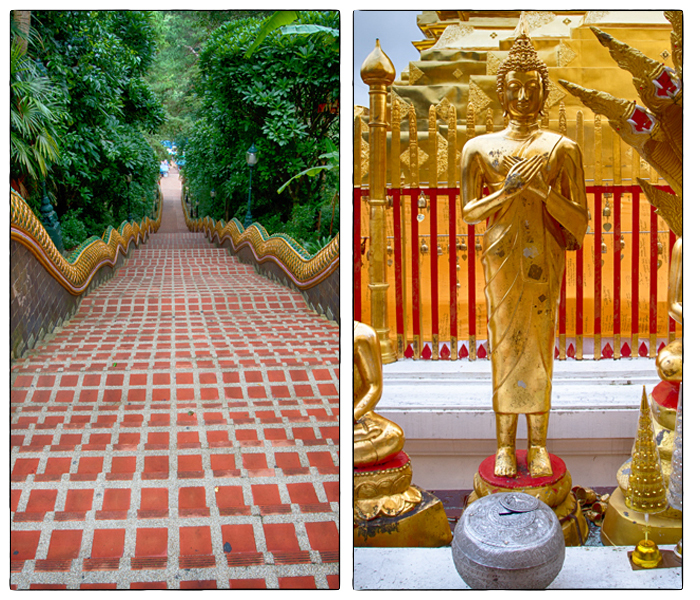 It’s 304 steps up a staircase flanked by nagas to reach the Thoughtful Buddha at the top of Wat Doi Suthep. Photos by David Lansing. After feeding the monks, Ketsara suggests we should continue up the forested mountain road to Wat Doi Suthep, one of the most revered Buddhist shrines in Northern Thailand. Frankly, I’m starting to feel a little templed-out. But Ketsara, saying she has something to show me, insists. “Where does that go?” I ask Ketsara. I can’t believe she’s making me do this. We stop after the first hundred steps so I can catch my breath, then continue on, up, up, in to the forest, the air getting cooler, thiner. Another painful hundred steps, and then a hundred more. By the time we reach the 304th step, I can barely breathe. Ketsara hasn’t even broken a sweat. She looks at me serenely and smiles. “Parami number five,” she says. Ketsara leads me to a building where an old monk, wearing a heavy saffron shawl and a saffron knit cap to ward off the cold, sits on a platform before several gold Buddha images. Without saying anything, she kneels before him. She motions for me to kneel beside her. The monk chants and uses a baton to bless us. 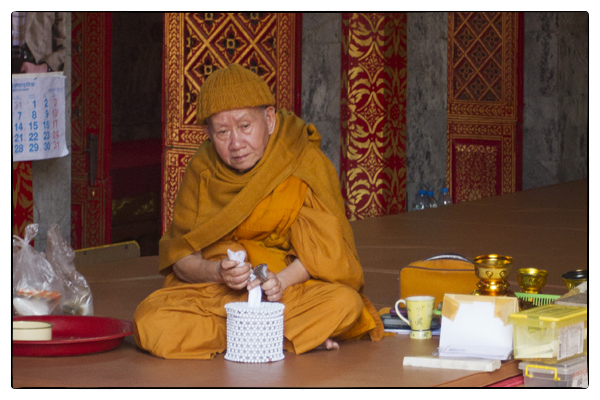 She drops some coins in the alms pot at his feet. It is raining lightly. We walk carefully in our bare feet to the back of the main chedi, a striking gold-plated Lanna structure, to a trough lined by all the different Thai Buddhas where oil lamps, in the shape of lotus blossoms, burn. 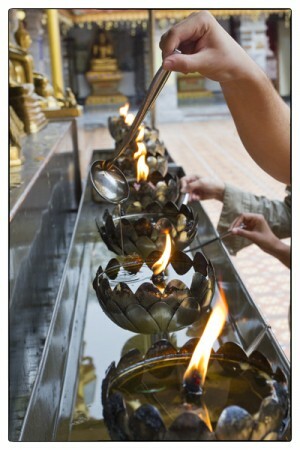 Ketsara takes a ladle and slowly pours oil from the trough on top of the lotus lamps. The flame jumps. Without saying anything, she looks at me and then looks at the small gold Buddha in front of the lotus lamp she has just lit. I follow her gaze. It is the Thoughtful Buddha. Pang Rumpeung. My Buddha. I take the ladle from Ketsara and drizzle oil over the flame which leaps and dances. Ketsara says, “Now make offering.” I take all the money out of my pocket and drop it into the alms pot in front of the Thoughtful Buddha. Ketsara smiles. As we are taking the 304 steps back down from the wat on the mountain top, I ask Ketsara if all that was for her or for me. She thinks about this for a moment. “We will see,” she says. 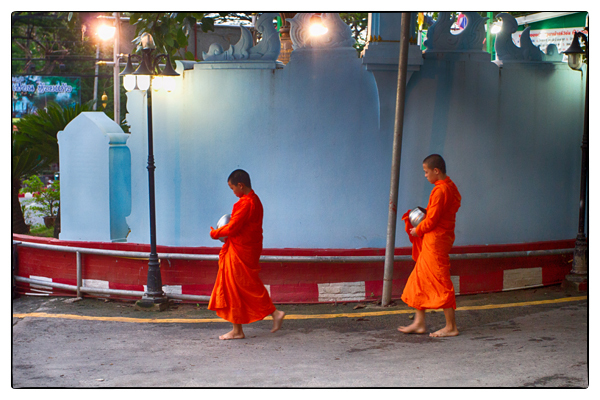 Novice monks walking with their alms pots early in the morning. Photo by David Lansing. It’s an odd thing, feeding the monks. Ketsara, who has bought a tray of monk food (it’s a bit like feeding the sheep at the petting zoo) was standing on the side of the road, trying to keep warm. The sky was just starting to lighten up but the street lights were still on. 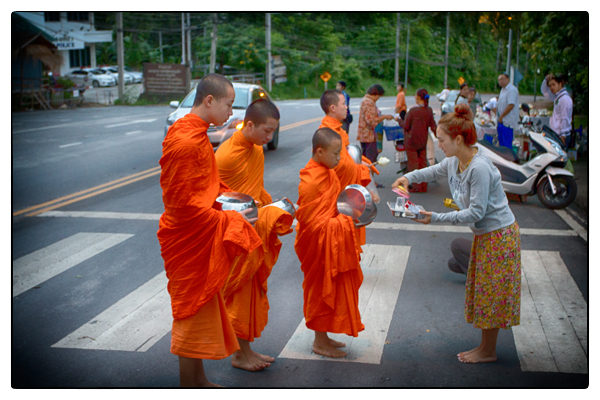 There were dogs in the street and bicyclists panting and grunting as they started the ascent of Doi Suthep. And then suddenly the first little monks appeared. I don’t know where they came from. 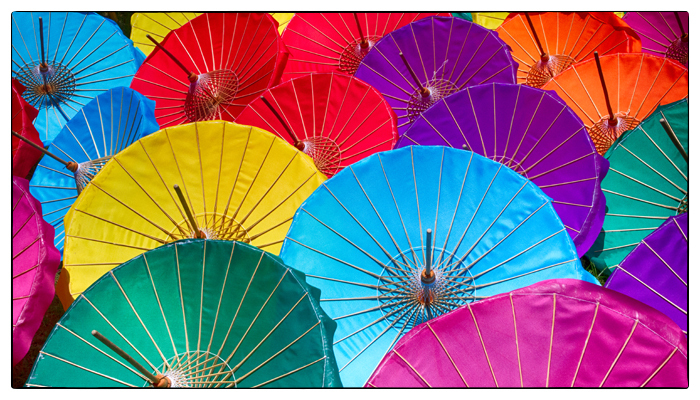 It was just like one moment there were no monks and the next there would be two or three coming down the street, stopping in front of the tables with food, looking down at their feet as a fried fish or a sticky bun was dropped in to their pail. Actually, I don’t think any of these Buddhists were real monks. They looked too young—some couldn’t have been more than 10 or 11. They were probably novices. 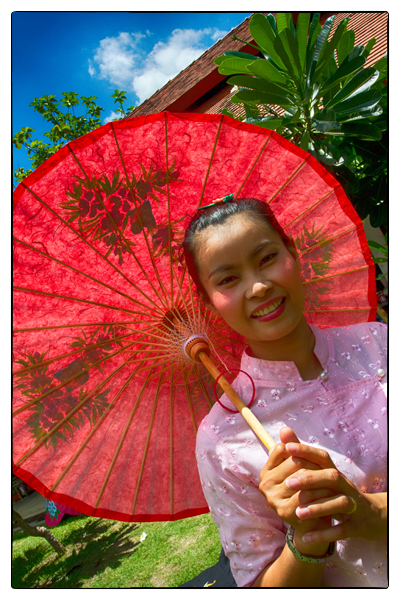 Thailand has over 200,000 monks and 85,000 novices. (Young boys can become novices at any age, but you cannot become a monk until you reach the age of twenty). What people probably don’t know (I didn’t) is that once you become a monk, it doesn’t mean you’re a monk forever. You can be. But you can also be a monk for just one day, if you want (I hear that three months is more usual). In Thailand, being a monk is kind of like going to school. It’s something you do and then you move on. In fact, many of the young boys become novices because it’s the best (and least expensive) education they can get. Their families put them in a monastery because they can’t afford to send them to school. Then, after a year or two years, they leave. So here’s the ritual: The monks (or novices) walk single file, oldest first, carrying their alms bowls in front of them. Laypeople, like Ketsara, wait for them, sometimes kneeling, and place food, flowers, or incense sticks in the bowls. It is very important that women not touch the monks (too much damn temptation!). The monks do not speak, even to say thank you. The giving of alms is not thought of as a charity. The giving and receiving of alms is supposed to create a spiritual connection between the monastic and lay communities. The monks never look at you directly—they just walk up, wait to receive their food, then walk away. It seemed oddly lacking in emotional energy to me, but when Ketsara was done giving the monks food, she came back to me looking like a new bride. “We are blessed,” she said. She may have been. I’m not so certain about myself. Ketsara feeds the monks. Photo by David Lansing. Monk food. Photo by David Lansing.